For decades it was believed that the black and white head and shoulders portrait was the only image that existed of Mercer. 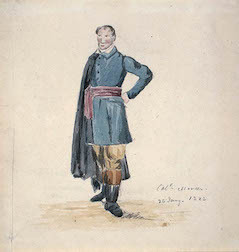 Now here he is, painted by a fellow artillery officer in 1828. He looks quite a dandy! Of course historians never take anything at face value, and so I am looking further into the provenance of this portrait. In the meantime, if you’d like a copy please buy Mercer’s book of paintings, and this image is there, bigger and better quality, on page 14. Exclusively available in the UK through this website only here.